The plus-one process starts with the narrating of an originating situation, taken by the speaker to present some kind of challenge. 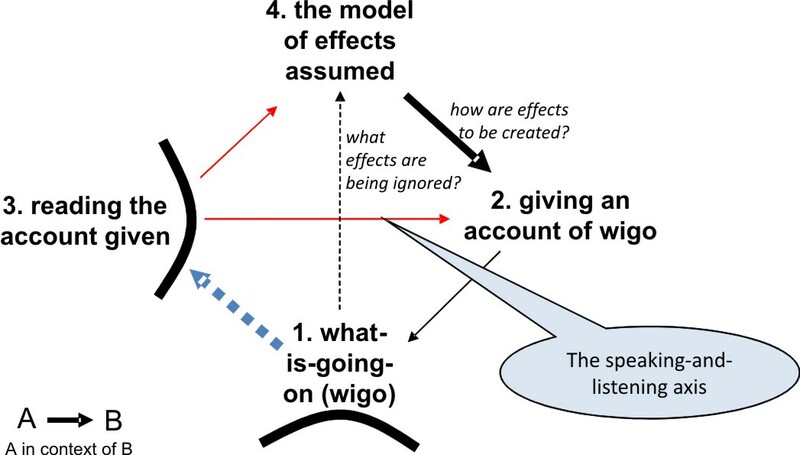 The process generates three metaphors that point towards gaps, not only about working with the difference between espoused theory and theory-in-use, but beyond that at the difference between ‘wigo’ and ‘wiRgo’ – not only reflecting what is symptomatic of the interests invested in wigo, but also what is symptomatic about what is being discluded of wiRgo. The plus-one process concludes with the participants “discussing what questions the metaphors raise about originating situation in terms of ‘gaps’ and the risks they imply are present”. The next step, in order to follow through on these questions, is to put them into the form of a dilemma, as in dilemmas as drivers of change. This blog aims to join up the thinking between these and the blog on stratification, in which a network is described as being formed by interacting actants allied by a relation to a social object that operates as the (final) cause of the network. The narration of the originating situation is made by an ‘actor’ (the speaker in the plus-one process), and indirectly by other ‘actors’. 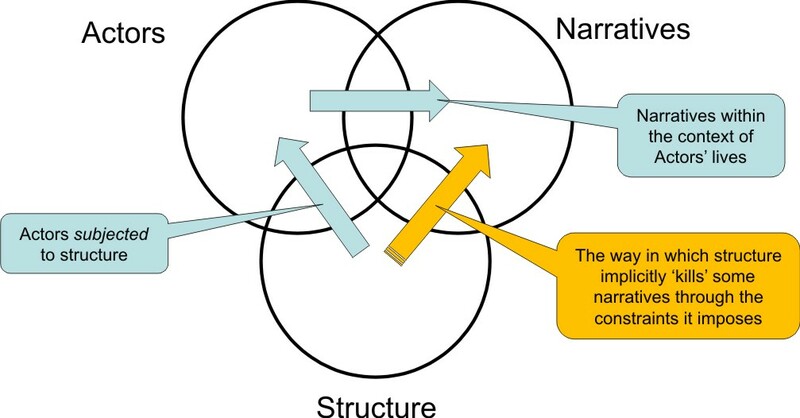 The point of the plus-one’s metaphor is to come up with a metaphor that, in its structure, says something about the ‘structure’ within which the actor has formed the narrative, while at the same time pointing towards might have been left out (‘killed’ in the diagram below). What is meant by ‘structure’ here? Dilemmas emerge because of the way non-discursive formations ‘structure’ the way we narrate. Thus implicit in our narrative is some kind of process that takes place over time, and that leads to an outcome. This relation between process and outcome is based on framing assumptions (‘axiomatics’ or ‘presumptions’) that are reinforced by consequence 1. Thus consequence 1 following the outcome enables the narrative to remain within its framing assumptions. Consequence 2, however, flips the narrative out into some ‘other’ set of framing assumptions. What ‘flipping’ means here is the disrupting of the ability of the actors to remain subject to the framing assumptions, requiring them to adopt some ‘other’ set of framing assumptions. A dilemma manifests itself as an oscillation over time between two or more of these formations. The ‘impossibility’ then refers to whatever it is around which this oscillation is taking place. This oscillation has the characteristics of some oscillating pattern of behaviors that repeats. The dotted line formation represents a new formation that holds the underlying dilemma in some new way, making it possible to hold the impossibility in some way. In practice, one of the formations will be dominant, the ‘otherness’ of the other formations (aka counter-narratives) reflecting the nature of the underlying impossibility. The three metaphors emerging from the plus-one process provide a means of identifying a somewhere else – an ‘other’ framing aka counter-narrative – that is, in relation to the originating situation, an ‘other’ side of a dilemma. The differences between the dominant and ‘other’ formations are ‘gendered’ in the sense that holding both sides of the dilemma, in order to approach the underlying impossibility, is engendering of innovation. Only when we have both sides of the dilemma and the oscillation-inducing ‘flipping consequences’, can we THEN ask: what is the underlying impossibility around which this oscillation is taking place? Using Foucault’s formulation of a discursive/non-discursive practice, (1) are the ontically defined (i.e. pre-existing) ‘objects’ implied by the ‘concepts’ forming the content of the narrative in (2). This narrative is formed through the use of ‘concepts’, which are ways of operating on ‘objects’. (3) is then an ‘enunciative modality’ from which (2) can be made sense of, with its implicit relation to (1) mediated by the 1-4-2 relation. The way in which both (2) and (3) are taken up is subject to (4), the unifying theme guaranteeing two things: that way of making sense between (2) and (3); and that way of being in relation to (1) ‘objects’. (4) thus defines the framing axiomatics under which the account of process and outcome are narrated to (3) from (2) in relation to a wigo in a (1) ontically defined by its ‘objects’. Foucault also speaks of unifying themes (4) as covering over ‘points of diffraction’ – places where the efficacy of the unifying theme breaks down. The effects of these ‘points of diffraction’ are what is picked up by the ‘consequence 2’ flipping the narrative into ‘other’ frames. What is ‘Really’ going on (wiRgo), then, is what is glimpsed in the liminal spaces between these frames. To understand this, we need to look more closely at the two triangles in the diagram above – 2-3-4 and 1-4-2 – in order to understand what is meant by the ‘impossible’ axis and by the ‘impossibilities’ underlying dilemmas. the structuring imposed in order to create inter-subjectively shared meaning – the kind of structuring described by Foucault. In the above diagram, this is the 2-3-4 triangle, corresponding in the diagram below to the work-truth-agency triangle, the wigo ‘objects’ being implied. the structuring imposed by the structure of the unconscious, including the effects of the lack of the unconscious on the subject’s relation to being. This is the 1-4-2 triangle above, corresponding to the production-agency-work triangle below, except this time the ‘production’ position is wiRgo, the lack of the wigo ‘objects’ with their relation to a plus-de-jouir. This relation to a plus-de-jouir is the relation to the repetition of the drive. It is on the basis of questioning the form taken by this repetition that the engendering of a network intervention becomes possible… this is where the personal becomes political. The originating situation is a narrative of a situation that is problematic… that is ‘narrative’ (as in footnote 4 of leadership qualities and the north-south bias) as distinct from the ‘actors’, one of whom is speaking, the other listening. The ‘structure’ is what is implicit in the way the ‘actor’ is forming the ‘narrative’. This is a discursive/non-discursive structure i.e. some mix of espoused theory and theory-in-use. 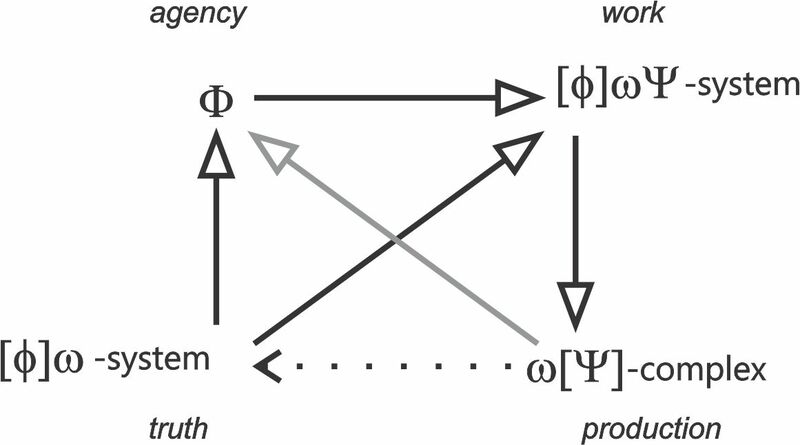 The combined effects of the listening-to-the-speaking (figure 4 in what might make translation difficult from a lacanian to a kleinian reading of Freud), experienced counter-transferentially by the person in the plus-one role, are articulated in a metaphor – an organisation of significations that has its own structure. The structure of this metaphor, then, tells us something about the ‘structure’ implicit in the narrative of the originating situation. In Lacanese, this ‘structure’ gives us some insight into the structure of phantasy ($◊a) underpinning the actor’s structuring of the narrative. The frame of a dilemma is, at its roots, a non-discursive formation. 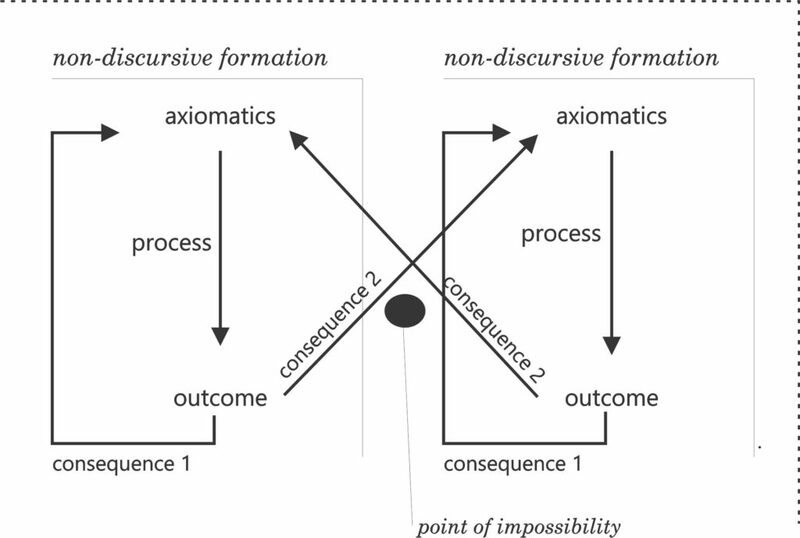 For more on dilemmas, see dilemmas as drivers of change – a way of being in relation to what-is-going-on (wigo)… the narrative formation is best approached by first elaborating the ‘process’, then saying what is the ‘outcome’ of this process as made apparent by the narrative formation, then asking what are the framing assumptions built into this relation between process and outcome. So far, then, we have the dominant framing of the originating situation as framed by the speaking-and-listening. The impossibility is ‘held’ in Winnicott’s sense – limiting the complexity of what is being addressed by the two sides of the dilemma. The impossibility cannot be ‘contained’ in Bion’s sense of being given meaning to. It is the imaginarisation of this experienced impossibility that is the (a) of an underlying (drive) structure of repetition that gives us some clue as to what is Really going on (wiRgo). Making common cause around this (a) is how a network intervention can begin to be formulated. It is this different understanding of discourse that takes teh Lacanian understanding into a 3rd epoch and leaves Foucault identified with a 2nd epoch. See are we entering a third epoch?. Any giving up of jouissance is always of a partial jouissance. What is being defended though, leading to the disclusion dynamic, is a plus-de-jouir. This is the relation to wiRgo. Note in the plus-one diagram that the 2-3-4 relation is the discursive practice with its implied ‘objects’, while the relation to wiRgo is organised by the 1-4-2 relation. These two triangles are both present in the Lacanian discourse that describes the subject’s double subjection… the dominance of the discursive/non-discursive frame secures a particular way of taking up double subjection.